Some people search for years before choosing a vocation, while others find a line of employment, but little fulfillment at the end of that pathway. With a satisfied smile, Gord Mercer says he's found a balance of both. "I enjoy never knowing what's coming, one day to the next," he explains of his family practice in Port Perry. "Every day's different, and with such a wide range of situations and people, you couldn't ask for more." Gord chose his calling early. Even as a young man, he knew exactly what line of work he intended to pursue and never wavered. "I honestly never considered another career," he recalls. "And why that one…? I admired our local doctor, but it was more than that which steered me into medicine. I enjoyed challenges and mysteries growing up, and solving those is exactly what a doctor does." The young man from Sutton took up pursuit of his goal at Kingston's Queens University. His thirst for diversity defined his specific medical path. "I decided on family practice because it offered such variety: a bit of office, clinic, emerge, and obstetrics." The location of his training also foreshadowed the future. "I did my residency in a rural community near Winnipeg. In many ways, that town was like Port Perry in size and its hospital's service area." But beginning his career – in any town – was not yet in the cards. "(My wife) Kathy and I took a 14-month backpacking holiday after graduation. We'd worked hard in school, and this was our reward." The trip would see them crisscross the Pacific Rim, from the South Seas to the Asian continent. It even included some professional experience, doctoring in New Zealand for a short period. Ironically, it was Kathy's skill set which threw that door wide open. "We'd decided to look into an exchange program for doctors – 'down under' they recruit docs to provide summer coverage. We found out that Kathy's credentials were one of their most in-demand positions. They said I could come along as her 'dependent!'" Kathy's degree in Occupational Therapy cemented the plan. "It's an unheralded profession which serves a wide variety of needs in society," Gord says proudly of his wife's designation. "Here she works with children with special needs as part of the school system, but in New Zealand her role was quite different: she helped geriatrics with practical adaptations in their daily lives, like the use of devices to facilitate dressing or how to best position a grab-bar." Port Perry's Medical Associates numbered ten when Gord was ready to begin his career. He recalls his hiring in early 1989 as a perfect storm, a coming-together of the clinic's needs and his ability to contribute. 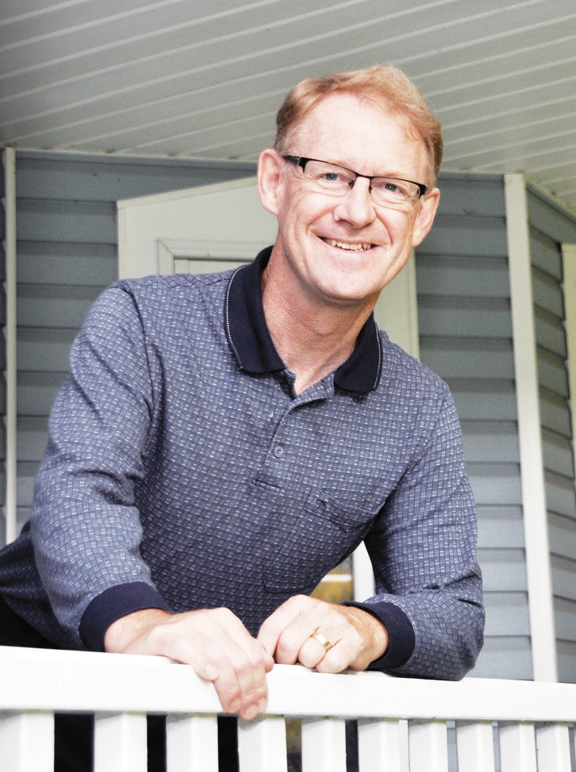 "I actually came knocking at their door, after looking into a number of communities' programs. There was no job opening posted." "There was a common team-based approach among the members which was exactly what I wanted, and I suppose I had the makeup to fit in. Each physician covered for the others by taking a turn in the office, emergency room… whatever was needed." "Dr. Allin and I clicked during that interview. I remember he said, after hearing about our backpacking adventure: 'Good, you've sown your wild oats!' He knew I was in for the long haul, and so did I." While he successfully integrated with his new professional surroundings, Kathy and Gord quickly became part of the community. "Kathy was pregnant when we came to Port Perry. When Laura was born – having a child growing up in the community – that's when you're truly a part of it. That was 23 years ago, and it's been perfect." The family expanded to four with the arrival of Brianna five years later. Their small circle became Gord's focal point. "I've been racking my brain, trying to think of what to say when that topic came up," he smiles as the conversation shifts from professional to personal life. "I don't have any consuming hobbies. I'm a devoted family man, and when I'm not focused on my practice, my attention's here with them." "I've coached soccer and hockey over the years, led Cubs in my early days here. As a family, we enjoy camping and canoeing, and just generally being together, even if it's something as simple as riding bikes into town for ice cream." His pride in his two daughters is evident in his tone. "Laura was born with Down's Syndrome, and thanks in large part to Kathy – her training and background were ideal – she's living a full life, independently. Brianna's off to Guelph University this fall, pursuing animal biology. Another doctor maybe…? She's not saying!" Gord's professional scope has expanded over time. "I've been part of the group teaching doctoral residents the past dozen or so years," he explains. "It's a way to enjoy the medical experience all over again – the thrill of those 'firsts' a new person feels – as well as helping to contribute to their professional development. And here's an interesting irony: maybe 50 per cent of the doctors in the current clinic came originally to Port Perry as part of that Rural Resident Program, and chose to stay. That says great things about the community." With the growing trend toward hometown medical services, Gord envisions further expansion of the clinic in the foreseeable future. "We have a great group of docs in our clinic. But there are other services – diabetic counselling, chiropodist, dietician – which we might be able to add to complement what we do with specialized skills." There's an infectious enthusiasm in his voice as Gord describes the future, whether it's talk about the clinic or his daughters' evolution into adulthood. Retirement, he insists, isn't anywhere on the horizon. "Kathy's given up asking me," he laughs. "I'm not considering retirement because I'm having too much fun!" It's a balance the whole world yearns for: a job to provide a comfortable living as well as personal satisfaction. All seek it, only a few achieve it. Gord Mercer's one of those fortunate people, who knew at an early age what he wanted from his professional life, worked hard to attain it, and now thoroughly enjoys the fruits of that labour.